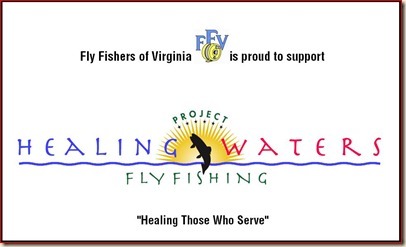 The FFV is actively participating in a program called Project Healing Waters Fly Fishing. We are helping Armed Forces veterans who are in rehab at the McGuire VA hospital here in Richmond and the Hampton VAMC. The PHWFF FFV crew is also leading the effort to establish the re-located ‘Warrior Transition Unit’ at Fort Eustis. These programs salute all of our brave armed forces, and strives to serve those who have come home wounded and aid in their physical and emotional recovery by introducing or rebuilding the skills of fly fishing and fly tying. FFV President Tom Mlot (R) presenting Douglas Dear the FFV Nat Burgwyn Lifetime Achievement Award. 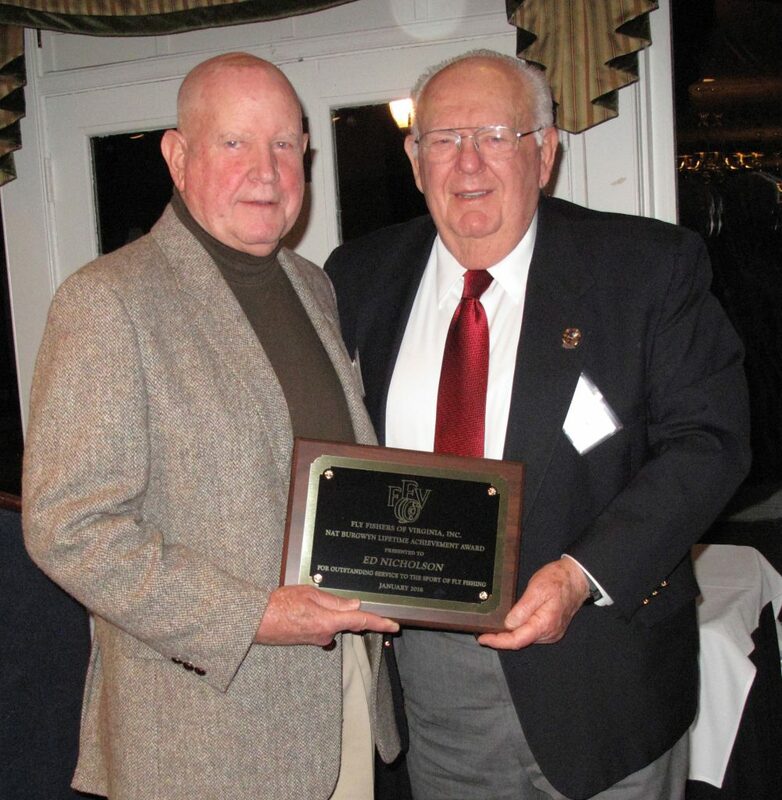 The FFV presented Douglas Dear the FFV Nat Burgwyn Lifetime Achievement Award at our January Annual Banquet. Leaving Tidewater Douglas headed to Blacksburg, Virginia to attend Virginia Polytechnic Institute, where he graduated with a B.S. in Business. He then went on to earn an MBA in Finance and Real Estate from The American University in Washington, D.C., where he was a Society of Real Estate Counselor’s Fellow. 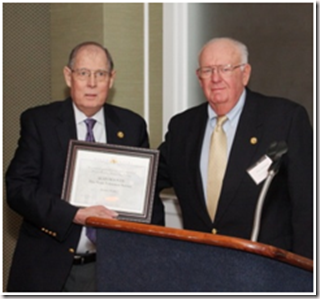 He later served as a member of the Advisor Board of the Kogod School of Business at The American University. It was his work in multifamily real estate finance that took him frequently to the west and reacquainted his hand with the fly rod. 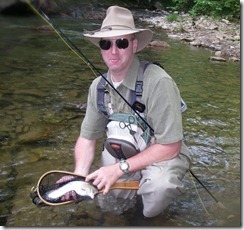 A fishing trip with a mortgage banking client and expert fly angler, reset the fly fishing hook. During the next 15 years he fly fished on most of the major, and many of the minor, trout waters in the Eastern and Western United States. He also traveled international in pursuit of Bone Fish, Permit and other salt water species. His real estate finance work culminated in being part of the senior management team that took Washington Mortgage (NASDAQ WMFG) public and subsequently sold the company to Prudential Insurance Company (NYSE PRU). Douglas resigned from Prudential as the Managing Director in charge of National Multifamily Originations to found Chesapeake Ventures LLC. Chesapeake is a private investment company, focused on investments in farm / recreational land development, income producing real estate and other business interests. 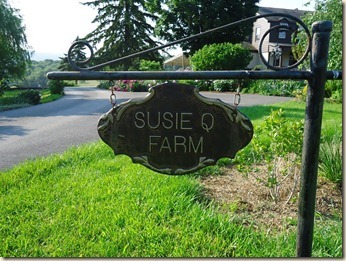 At the same time Douglas purchased the land for Rose River Farm, creating trout fly fishing preserve that is located in the Charlottesville, Virginia area. In 2011 luxury rental cabins were added creating a full service fishing destination. Through his ownership of the Farm, with its prime trout water, Douglas was made aware of a Retired Navy Captain (Ed Nicholson) who wanted to take a few injured soldiers from Walter Reed fly fishing. “My Grandfather was a West Point graduate and career Army Officer so the military has always been very important to my family. 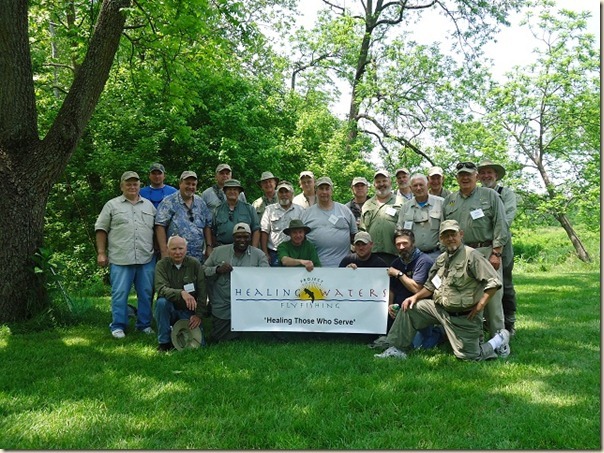 When I heard about these wounded warriors in need of a place to fish I was very excited and wanted to help in every way possible.” It was through this association with the “Captain” that Project Healing Waters became a major focus for Douglas leading to, at Ed’s request, his acceptance of the Board Chairmanship. As the Chairman of the Board and founding Trustee of Project Healing Waters Fly Fishing Inc, and now Chairman Emeritus,. 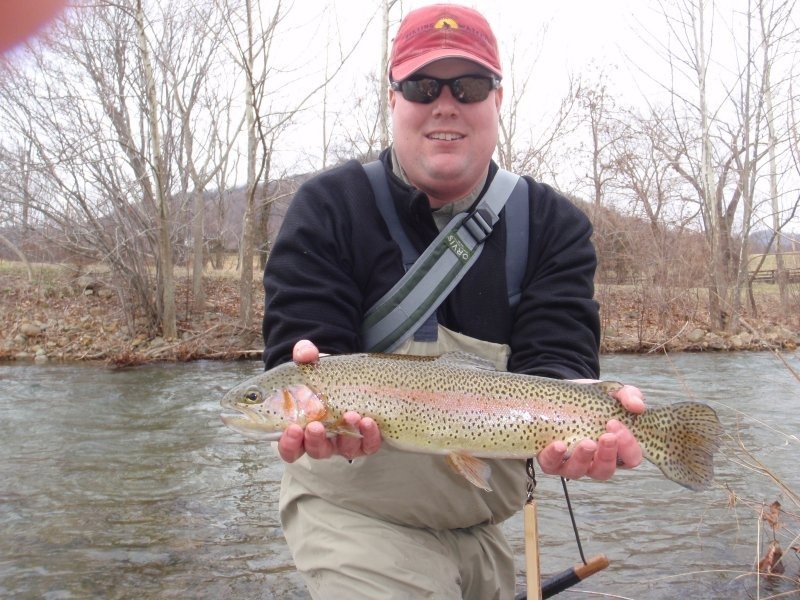 Douglas has been involved in all aspects of growing the organization that is dedicated to helping current armed service members and Veterans rehabilitate their injuries through fly fishing and fly tying. The program has gone from serving strictly Walter Reed to now working with over 170 major Armed Service Medical Centers,VA Hospitals, and Warrior Transition Units nationwide. In 2011 Douglas was recognized a LL Bean National Outdoor Hero for his work with PHWFF. 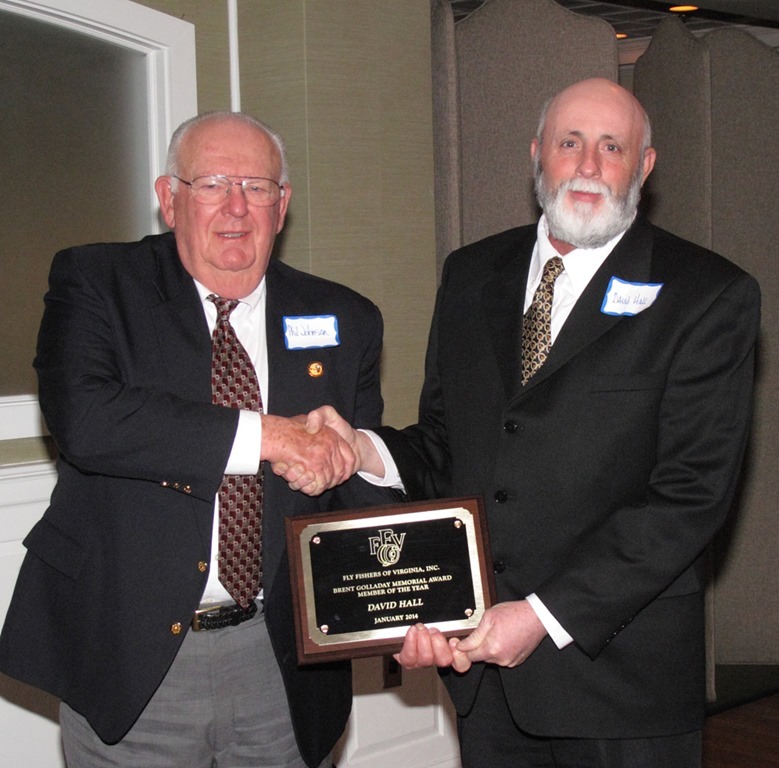 At the March diner meeting the FFV presented Project Healing Waters Fly Fishing founder Ed Nicholson with the Nat Burgwyn Lifetime Achievement award. 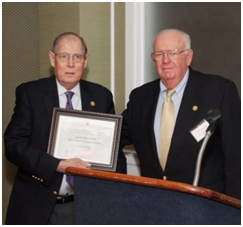 Phil Johnson (R) had the honor of presenting the award to Ed. Ed lives in Port Tobacco, Maryland, with his wife, Leslie, and his faithful bird-hunting companions, Pointers Ruby and Stella. Phil Johnson awarded Ray Babineau the ‘TFO Volunteer of the Year Award’. 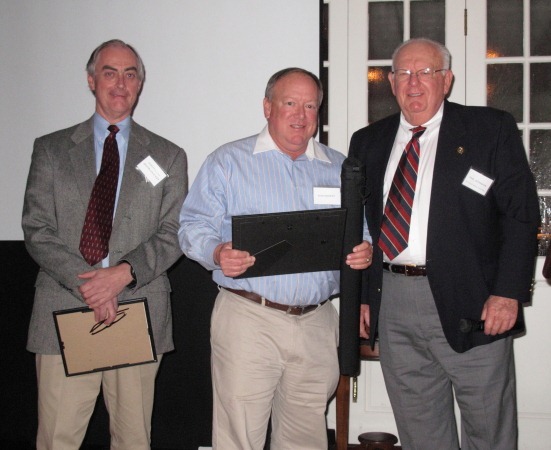 Ray was chosen for all of his great contributions to the region since becoming involved with PHWFF. In the past two years, Ray was instrumental in developing the much need training in this region that has improved the skills of the Program Leads. 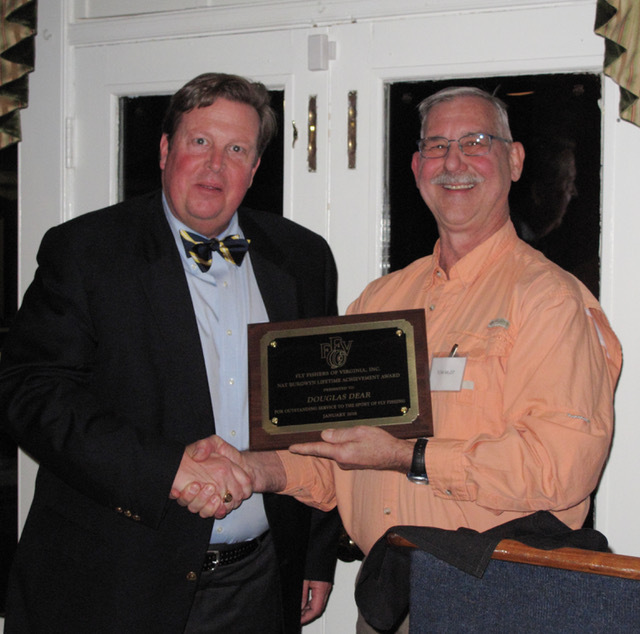 Ray has also stepped up to become the Regional Coordinator of PHWFF for Virginia . PHW volunteer David Hall was given a ‘Brent Golladay Memorial Award’ for his service to Project Healing Waters. 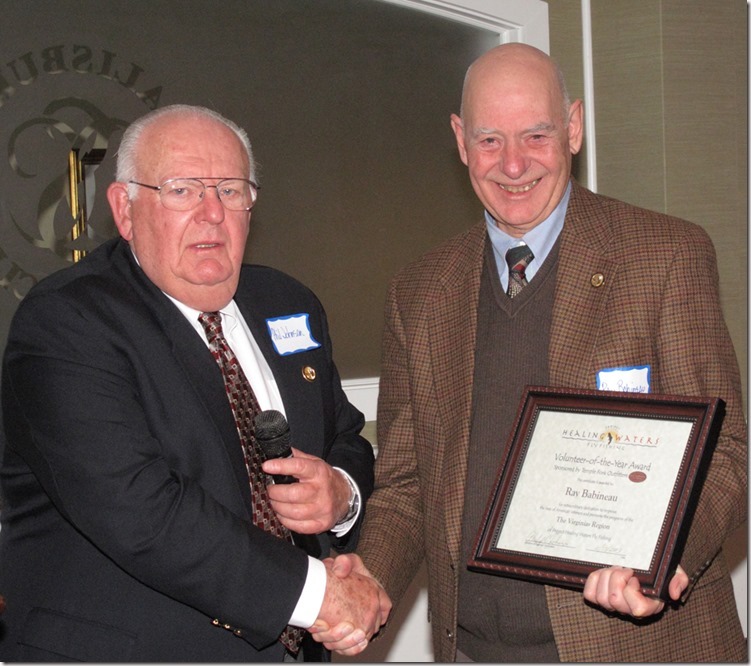 Phil Johnson, Regional Coordinator,The Virginias presented Alan Hoover, long time Fly Fishers of Virginia member, a Certificate of Appreciation for five years volunteer service to Project Healing Waters Fly Fishing. Alan is active in the support of programs at McGuire VAMC and Ft Eustis WTU . 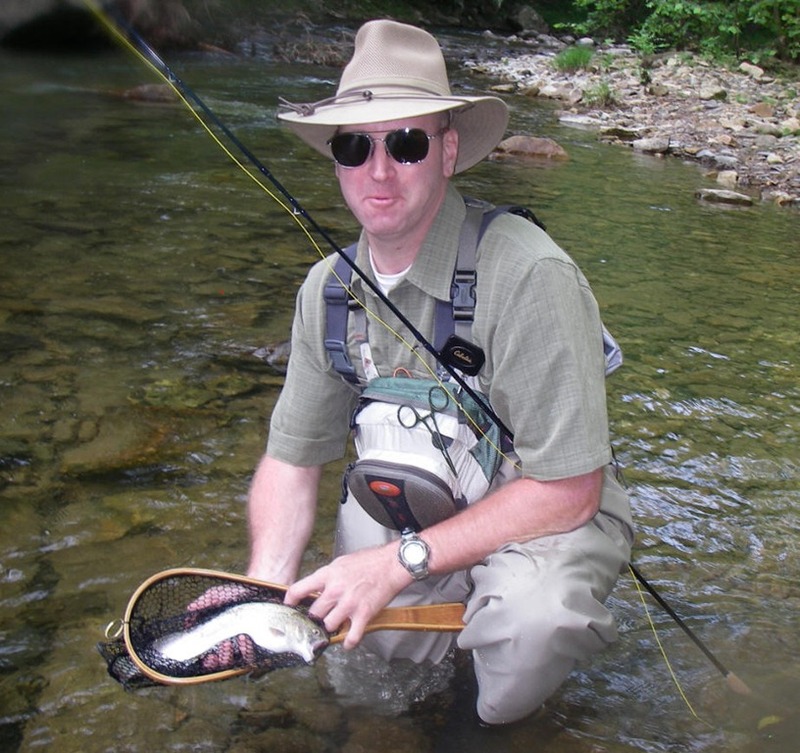 A very skilled fly tier,and fly caster Alan has helped many Warriors and Vets learn the skills of fly fishing. The Kenny Geandstaff Continuing Service given to members who have supported the many programs and projects run by FFV. It was one on those cool crisp fall days in October as all of the participants left their home location to head for Warm Springs in the mountains of western Virginia. The groups began to assemble around 2:30 PM and by 4:30 PM or so, all were present and accounted for at Warm Springs Inn. The Inn is old, dating back to the 1800’s, with even earlier foundations. It had that time worn but charming flavor and opened its doors to a great group of Warrior and Vets. We all assembled on the porches of the Inn where each Warrior and Vet was completely outfitted through the generosity of the Guilford Foundation. There were many thank yous and much happiness as gratitude was expressed. Dinner at the Inn followed and all had their fill. Some Vets and Warriors quietly asked for a second desert. Their wish was granted. 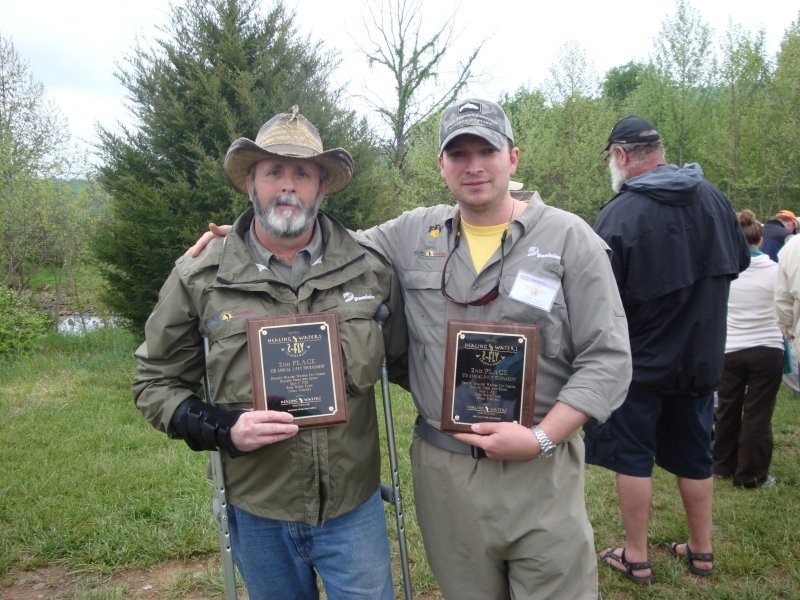 Ed Nicholson the founder of Project Healing Water spoke to the group and participated in awarding a fly rod to Bob White for being selected as Volunteer of the Year. All returned to their rooms for a good night’s sleep. Wednesday saw a pre-dawn start. The group gathered in the dark for a 6:45 AM wheels up for the twenty mile trip over the mountain to Back Creek. Light was breaking when we all reached the Community Center of Dominion Power Generating Station. Mike Puffenbarger, an Amish gentleman was waiting with a full breakfast. Almost all grabbed first for the coffee to gain some consciousness. After filling our bellies, we were welcomed by the Station Director, Sean Fridley. We are all impressed and in awe of the support provided by Dominion Power including the stocking of Back Creek with beautiful rainbow trout. Phil Johnson and Dan Genest laid out the day’s activities and assigned guides and beats to the Warriors and Vets. A quick ride down to Back Creek and one could then see a myriad of equipment, clothing, rods and reels and all getting suited up for the day’s fishing. Only a short moment after the first fly hit the water a Warrior was playing the first trout of the day, a beautiful colored sixteen inch rainbow trout. Many, many more were landed including several twenty plus inch rainbow. Also present in the stream were bass, sunnies and chubs. A first time female vet flyer fisher landed sixteen trout. The morning also provided all an opportunity to meet with and express thanks to our benefactors, Roger and Annette Kirby of the Guilford Foundation. It is the generosity of the foundation that provides for outfitting the Warriors and Vets and covering all expenses associated with the trip. They were gracious with their time and spoke with all of the participants. All took a break at the noon hour. 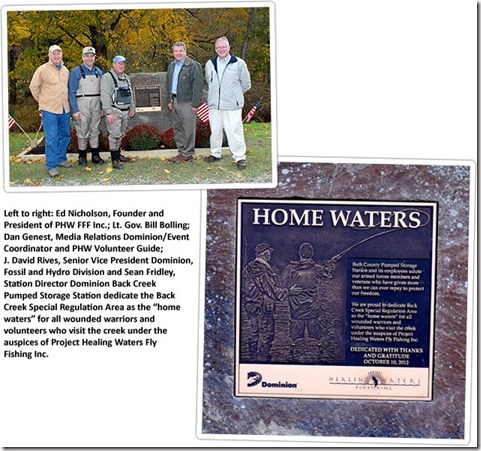 Virginia Outdoors reported on a ceremony that dedicated a monument to Projected Healing Waters as follows “With wounded warriors and veterans clad in fishing waders and eagerly eyeing trout in the steam beside them, Lieutenant Governor Bill Bolling today [October 10, 2010] dedicated a monument in their honor at Dominion Virginia Power’s Bath County Pumped Storage Station. 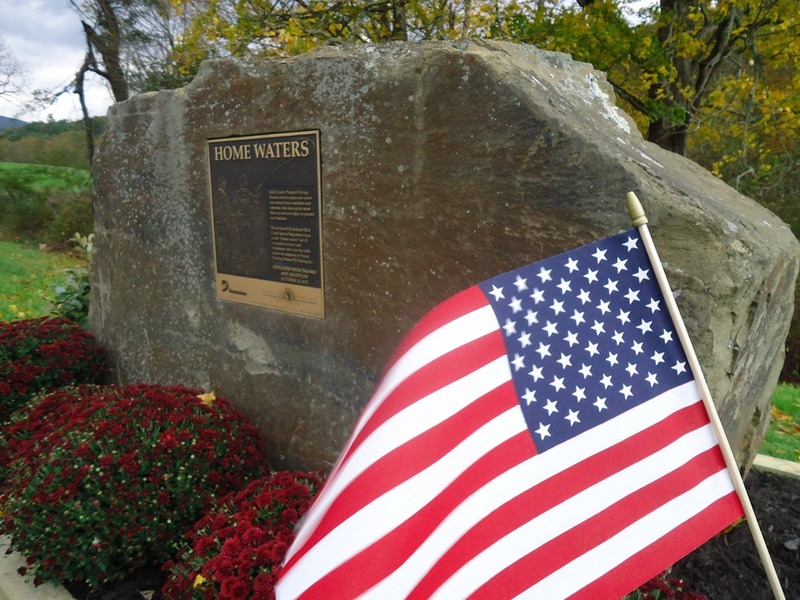 The monument is a gift from station employees to those who have been injured while serving in the military. It names Back Creek, which flows from power station’s lower dam, as the “home waters” for all soldiers and volunteers who visit the creek as part of Project Healing Waters Fly Fishing Inc., a national, non-profit organization that provides mental and physical relaxation therapy to injured military personnel through fly fishing. “This is an apt and fitting tribute to those who have served in the Armed Forces of the United States,” said Bolling, an avid fly fisherman. “Yet this ceremony is not about dedicating a monument. 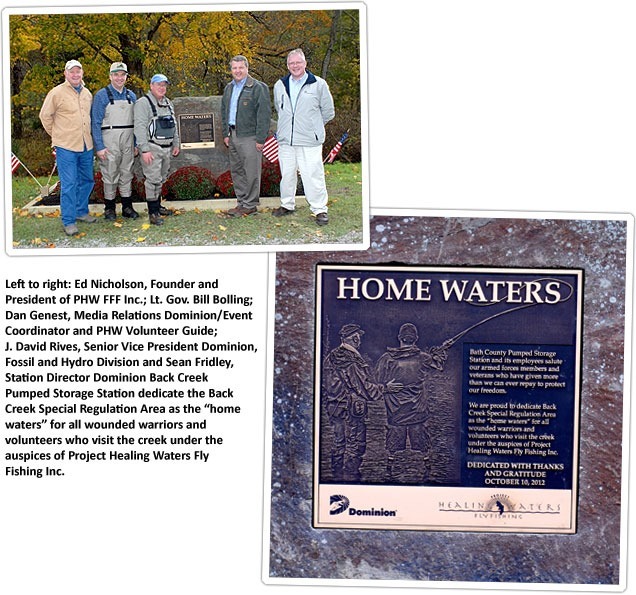 It is about honoring those who have sacrificed so much for us and our country.” Ed Nicholson, founder of Project Healing Waters Fly Fishing, Phil Johnson, PHW Regional Coordinator, J. David River, Senior Vice President of Dominion Power and Dan Genest of Dominion Power and Project Healing Watersalso participated in the ceremony. After lunch and the ceremonies, it was back to work on the stream. Many more fish were landed and released. For sure, no one went hungry because around 5 PM it was back to the Community Center for dinner. After that, we drove the twenty miles back to the Inn for a good night’s sleep. Thursday was pretty much a repeat of Wednesday with many, many more trout landed. The time on Back Creek ended with many happy Warrior/Vets who had etched many memories of the time, new friends, new skills, beautiful scenery, many fish and good room and board in the scrap books of their minds. It should be finally noted that the Warriors and Vets expressed their deep gratitude for the time and treasure given to make the trip possible.Many spoke of the beautiful setting, the new friends, and the ability to escape the everyday and put difficult issues behind them. 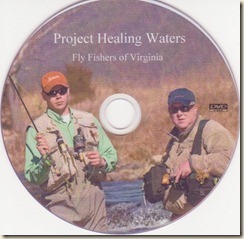 One can only conclude that the purpose of Project Healing Waters Fly Fishing was fulfilled. Images copied from Virginia Department of Game and Inland Fisheries Outdoor Report of October 24, 2012. 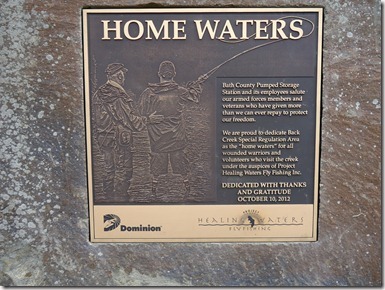 Here are some photos of the Back Creek PHWFF Dominion Monument. 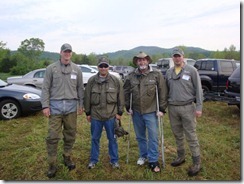 Broadway, VA–Ten disabled warriors and vets got to fly fish the private trout stream on the Susie Q Farm. The fishery is managed by Brain and Colby Trow of Mossy Creek Fly Fishing. 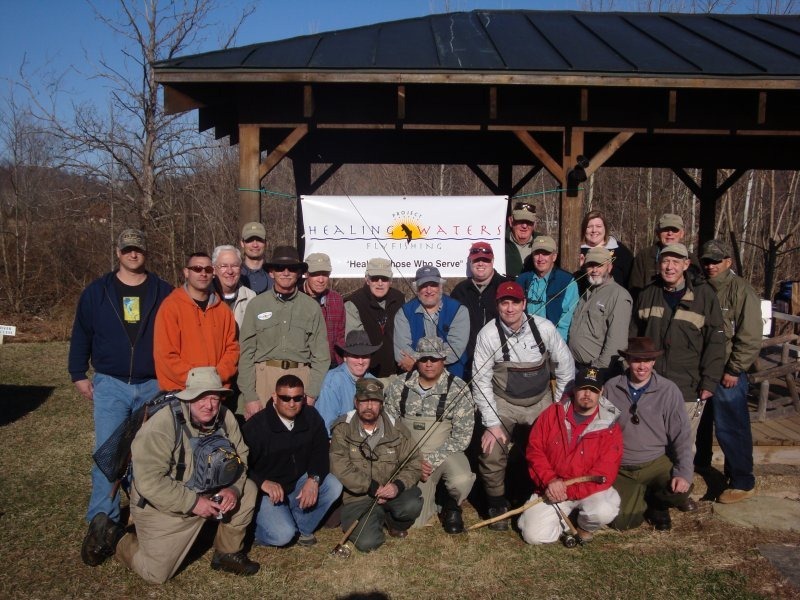 Project Healing Waters Fly Fishing (PHWFF) participants came from the Beckley and Huntington, West Virginia programs, as well as Salem, Richmond’s Hunter-McGuire VAMC, Hampton VAMC, and Fort Eustis, Warrior Transition Unit in Virginia. 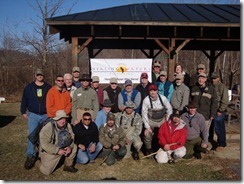 Participants were supported by volunteer guides for the two days of fly fishing on the farm. For a few warriors and vets this was the first time they ever fly fished on a moving water trout stream. To a man all were able to net rainbow trout and all fish were released. One of the major highlights of the trip was provided by the Guilford Foundation which for the last four years has provided the funds to totally equip each participant with top quality fly fishing gear. Each received a 9ft, 5wt fly rod package, waders, rain jacket, sling pack, and a box of files. The Village Inn in Harrisonburg, VA hosted the group with great accommodations and home-style meals. No one went away from the table hungry. In the evenings, the Inn opened its meeting room where many of the guides and participants tied flies and enjoyed talking about fly fishing in general. 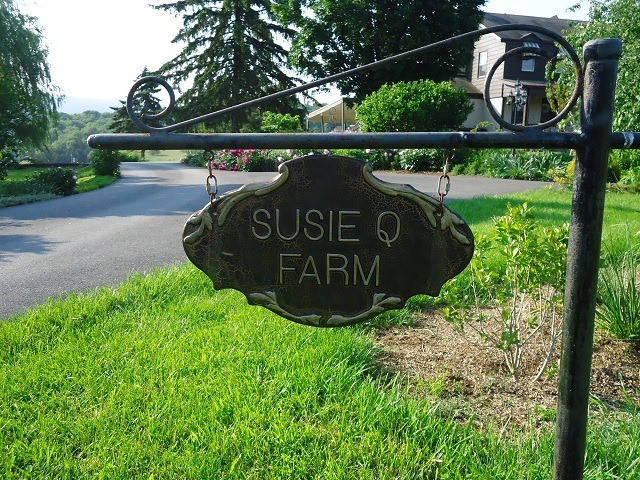 Mr. and Mrs. Robert Grace, owners of Susie Q Farm, are long-time supporters of PHWFF and frequently host groups of participants from the Virginias and National Capitol Regions of Project Healing Waters. 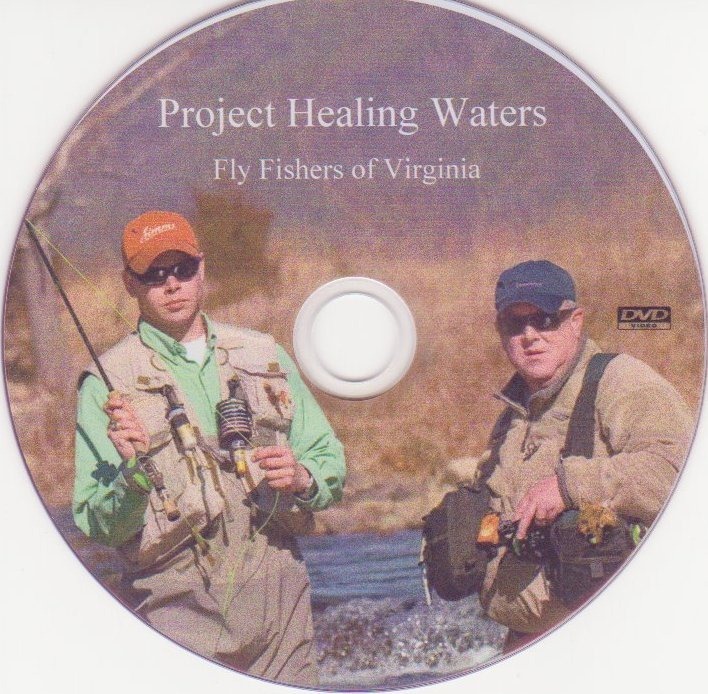 Phil Johnson, PHWFF Regional Coordinator for the Virginias, presented the Graces with a Certificate of Appreciation for all they have done for Project Healing Waters. There was outstanding weather in as much as all around the Shenandoah area there was heavy rain and wind. Most of the streams in the area were out of their banks but Susie Q had ideal water conditions. Everyone had a great time and many new fly fishers are now hooked. A special thanks to Brian and Colby Trow of Mossy Creek Fly Fishing who worked very hard in getting the stream banks and pools all marked for the guides. They also they provided up-to-date information on what flies were working and just how we should fish the water. 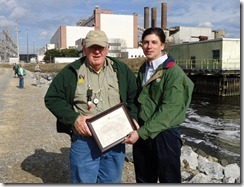 Phil Johnson, Regional Coordinator, Virginias Region presents a Project Healing Waters Fly Fishing Certificate of Appreciation to Dominions’ Chesapeake Energy Center employee’s for the outstanding support and hospitality given to the Warriors and Veterans for the last two years. The Warriors and Veterans have enjoyed the experience of fly fishing for large sea trout and drum at the famous “Hot Ditch”. 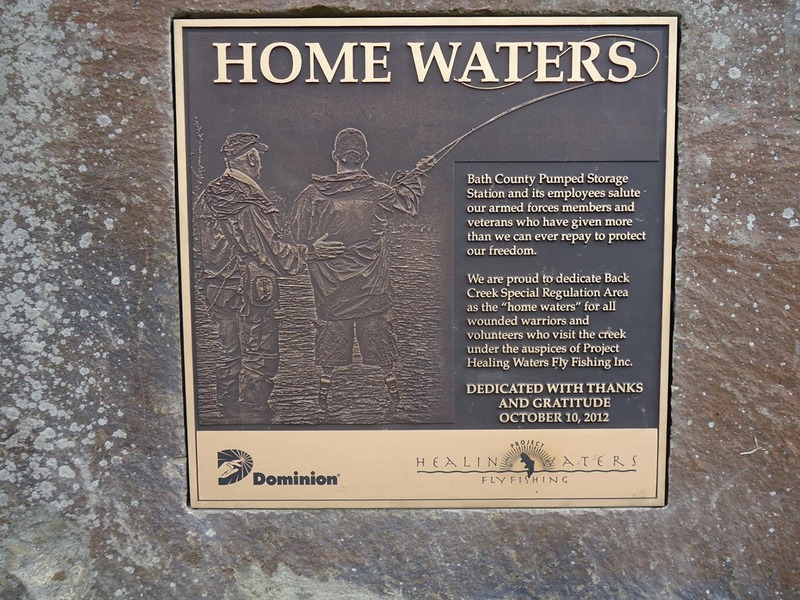 Dominion is a very strong supporter of the PHWFF programs in all of their service area. 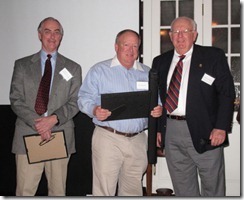 Dan Genest received the 2011 PHWFF Regional Volunteer of the year for the Virginia’s Region ( VA and WV). Temple Fork Outfitters is the sponsor of this award program and provides each winner a TFO BVK rod with the winner’s name on the rod. Having supported PHW for the 6 last years, Dan is much deserving of the award. 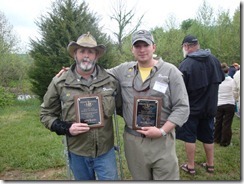 David Hall received the 2011 PHWFF Regional Participant of the year for the Virginia’s Region ( VA and WV). David was awarded an Orvis Access rod and reel. Departed Walter Reed Army Medical Center (WRAMC) 1100 hrs. to pick up Mr. David Mattocks; arrived at his home at 1306. He was ready to go with his bag packed and in the driveway. We departed his home by 1315 hrs. with an ETA of 1628 at the Best Western in Covington, Virginia. We arrived and checked in at 1638 hrs. Everything was ready upon our arrival. I did a quick check and found the banquet hall and buffet set up with gear for the guest warriors of this trip. This was unbelievable!  Truly Christmas in June. Phil Johnson and the PHW organization had secured a fantastic assortment of gear for each Warrior and Veteran angler thanks to the generous support of the Guilford Foundation. Orvis breathable boot foot waders, Orvis breathable fishing rain parka, an official Project Healing Waters TFO 4 piece 5 weight, 9 ft rod, reel and line setup with travel case, a chest tackle pack with hemostats, nippers, and aluminum fly box with the PHW logo on it, stocked with an assortment of 15+ flies for the Escatawba Water was all purchased with a grant from the Guilford Foundation. The guides drew the names at random of the warriors and called them up to present them with their complimentary gear setup and welcome them. There was a volunteer guide for each warrior. After everyone had their kit and was seated, Phil made a few opening remarks about the program. Wow, did I learn a great deal and was even further impressed by the organization. I never knew there are over 100 chapters in North America to include Canada, and that it took nearly 2,000 volunteers to serve the needs of nearly 3,500 Warriors. Furthermore there are only five paid positions in the entire PHW organization allowing an incredible $.88 cents of every donated dollar to be used on the warriors. 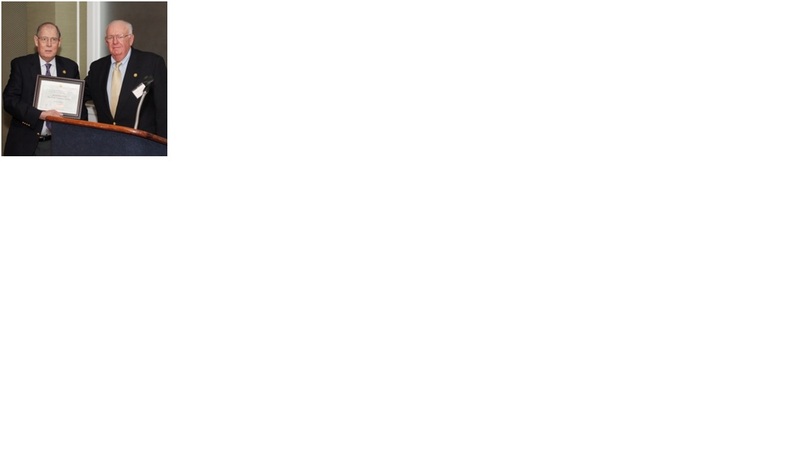 This is an incredible statistic for a non-profit organization. The dinner buffet began and was outstanding! Baked chicken and sliced prime rib au juis! Finally the desert tables were brimming with two types of pie: pecan and apple, plus cheesecake and superb fresh strawberry shortcake. Soft drinks and coffee were served by a very friendly and courteous wait staff of the Best Western – first class service! The owner of the Escatawba Farms, Derrick Barr, welcomed us and gave a bit of the history of his family-run business and to give his obviously heartfelt thanks to the warriors. He has a phenomenal resource in a 500 acre, 1.7 mile pristine trout stream that has been cared for and developed by his family since 1920. The next drawing of the evening was to assign guides to warriors for the next day. We were going to switch after the catered lunch break and again twice on the second day of fishing. What a great opportunity: the experience of four separate guides on some outstanding trout waters with top quality gear donated to each warrior. After dinner several of the guides handed out additional flies they tied for this trip to each of the warriors as an additional thank you. Others held tying classes/demonstrations in their rooms to nearly 2300 hours. We were like a bunch of kids the night before Christmas. Sleep was a challenge due to the promise of a fantastic day of fishing. Day two: A fantastic complimentary breakfast served by the ever courteous Best Western staff. We have a plan to depart the hotel by 0700 and be on the water by 0730. We get to the Escatawba Farm by 0730. The owners greet edus and the guides sorted out who will start fishing where. The hosts accommodated the less ambulatory warriors with Gator ATV transportation and some locations with easier vehicle access. The guides did a wonderful job matching flies to the fish in each of their unique locations. My first guide has over three years experience on this stretch of river. He was very accommodating in all aspects of guiding from recommending fly patterns and sizes, as well as casting and approach techniques. We stopped for lunch and headed back to the pavilion for a lunch of a mix of hot and cold sandwiches including Philly cheesesteaks, club style, and Italian hoagies, along with an assortment of chips and some homemade brownies that were superb! There were plenty of soft drinks and water to drink. After lunch we drew for new guides for the afternoon and new stretches of water to fish. This is another great opportunity to learn from another very experienced guide on how he reads the water and conditions and makes his fly recommendations. My new guide has over seven years experience on this stretch of water and has tied some incredible flies just for this trip. I was able to land five fantastic fish, three larger than 18 inches and one above 20 inches, in the running for the largest of the trip. We all got back to the pavilion and begin to swap some fish stories of the day all by 4:15, and back at the hotel by 5 pm. We meet again at 6 pm to depart for what promises to be another fine meal at a local seafood restaurant, the Cat and Owl. Phil greeted us again and informed us of our menu choices of either a steak or salmon dinner with a full selection of side dishes and drinks. Phil made another presentation, this time a print of the Campaign Medal Fly Plate that is on display in the American Museum of Fly Fishing. The print is beautiful and is a nice tribute veterans integrated with an attractive selection of flies that match each of the campaign medals in the print. Next on the agenda is to download everyone’s photos and begin the consolidation process. I was impressed with the quantity and quality of the pictures taken. Folks wandered off to bed without another round of late night tying lessons. The sun and excitement has taken a toll on everyone and breakfast will come quickly at 0600. Day 3: We eagerly rise and meet for breakfast and prepare for another great day of incredible fishing. The weather promises to be even warmer in the upper nineties but should be a bit more overcast with a possibility of scattered showers later in the day. Breakfast is timely, filling, and tasty once again. We clear our rooms and prepare to convoy back to the Escatawba and make our final departure from there. Once back at the main guest pavilion, we again draw our guides and get our assignments along the water. Another fabulous guide on terrific water – this trip is marvelous. I am blessed with another three wonderful fish before we break for lunch and make the final consolidation of photos of the trip. Everyone is very helpful and I am able to get everyone’s photos and start burning CDs so everyone can leave with a copy of all the pictures as of lunchtime. We are now up over 290 photos! They just barely fit on one CD. It took about 6-8 minutes to burn a disk. The selfless service displayed is touching. The efforts will be remembered and enjoyed for years to come. Thanks to all who helped, everyone on this trip and PHW benefitted from the efforts. In closing, I cannot say enough about what a wonderful opportunity the Escatawba fishing trip has been for all of the warriors and me. A number of us who have fished before may not have thought we would ever get back out on the water again. Others who have never experienced the beauty, relaxation and peace of fly fishing, cannot have imagined such a fantastic opportunity. I thank the owners of the Escatawba Farms and all the guides who volunteered their time and gave generously of their advice, experience and fly boxes. Additional thanks to all the sponsors and vendors who donated an unbelievable amount of high quality equipment. It provided a super way for someone to be introduced to a wonderful and therapeutic hobby which can provide so much to the individual and the environment alike. The conservation and habitat management will serve to benefit generations of fishers and non-fishers alike. For the warriors, the peace and calm of enjoying some of the best nature has to offer grants a level of peace and serenity not easily experienced, especially on the road to recovery as a wounded warrior. A special thanks to Mr. Phil Johnson for the countless hours spent coordinating the vast number of people and vendors to provide a once-in-a-lifetime quality event for us. His energy, passion, and enthusiasm for fly fishing, desire to help the warriors, and work ethic serves as a model worthy of emulation. Phil, thank you for helping me take some critical steps along my road to recovery and healing. 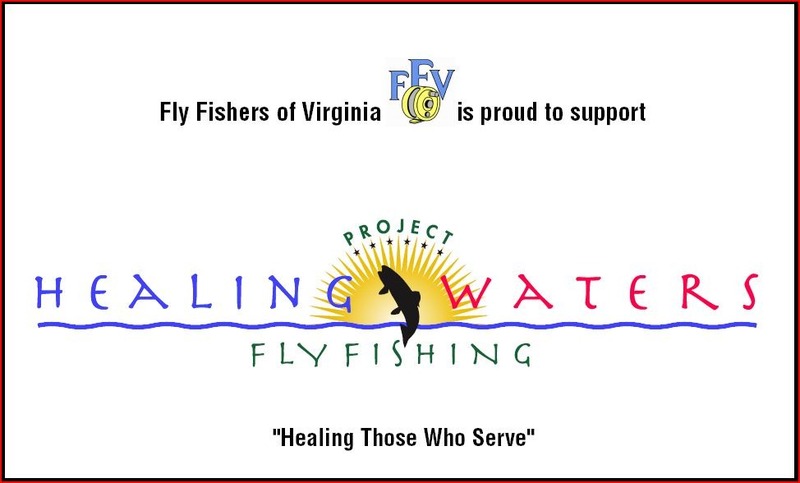 Project Healing Waters Fly Fishing is grateful to the Guilford Foundation for the financial support and encouragement it has provided to the Virginias region and PHWFF organization for the past three years. To date, $44,500 has been received and used to fund the fly fishing outing expenses, including lodging, transportaton, and fly fishing gear for this specific trip. 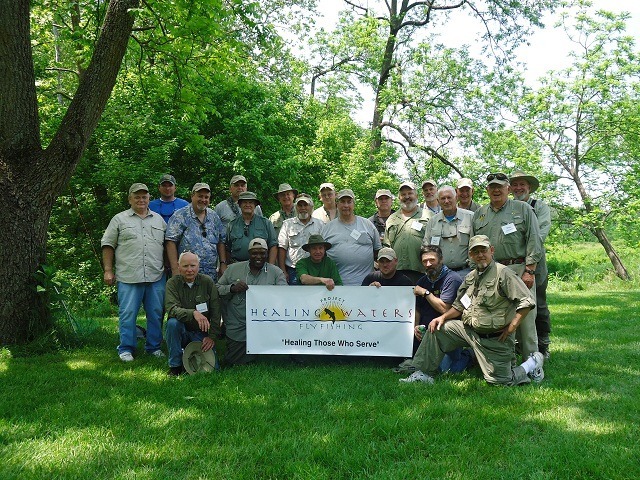 The recovering troops and disabled veterans who participted in the PHWFF program and joined the group were treated to an exceptional quality of life experience that included fly tying, fly casting and togetherness. Brain Trow and Sgt Marcos Rivera team #1. Colby Trow and David Hall team #2. Colby and David won second place in the Pro Division. 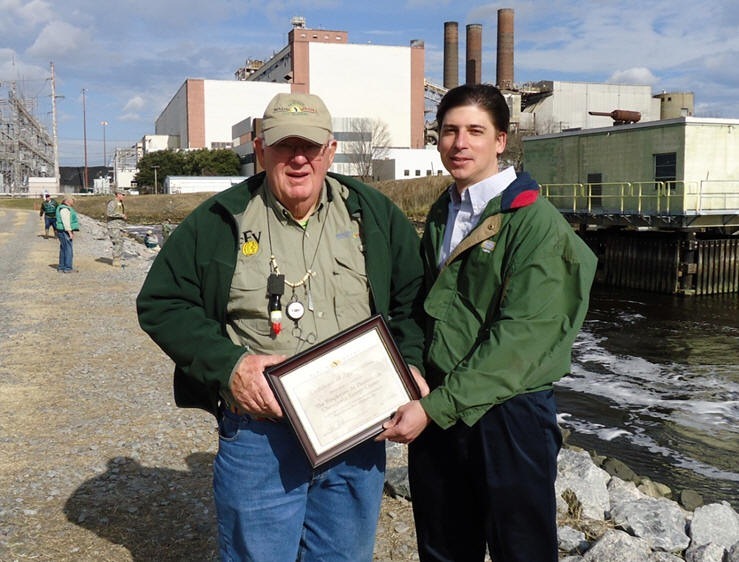 Phil Johnson of the Virginias recently met with John Kelly, General Manager of Salisbury Country Club to present John with a certificate of appreciation for continuous support of the Urban Fishing program. 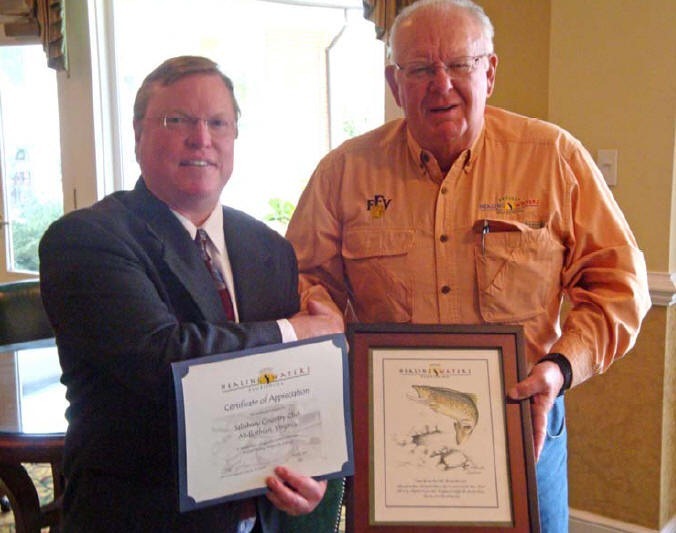 Along with the certificate John was presented a print of a jumping brown trout depicting the PHWFF mission. 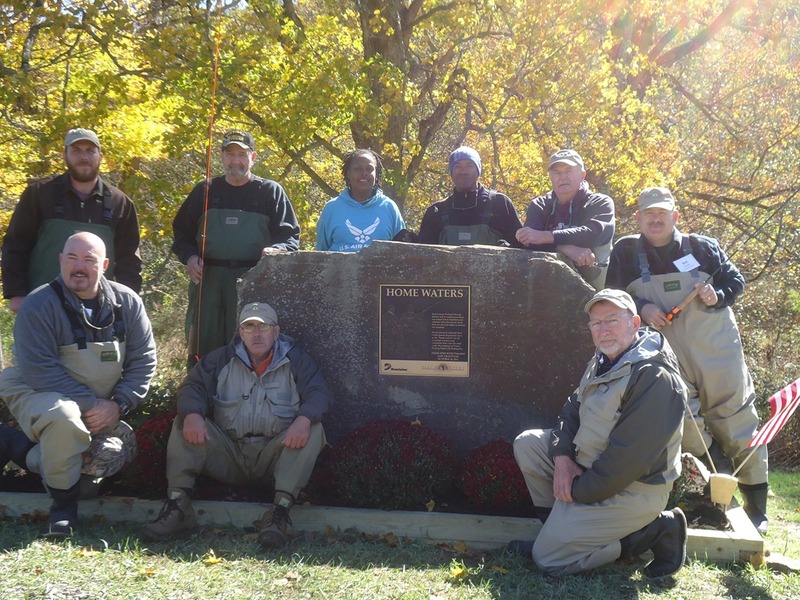 The need to have an easy access flat grass area next to a pond full of fish was the wish of the PHWFF volunteers and recreational therapists at McGuire Center. The spinal cord injury unit has many vets and warriors who are confined to wheelchairs. This limits to some degree where they can put into practice the fly fishing skill they have gained at the VA center. The back 9 of the 27 hole golf course fits the bill to a tee. 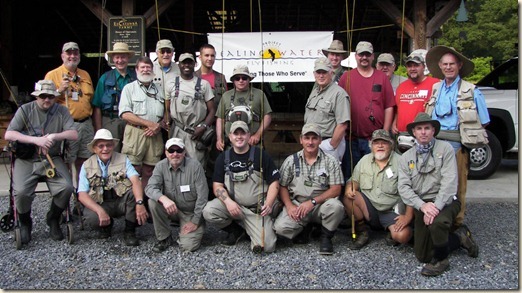 During the spring, summer and early fall months PHWFF and McGuire travel to the Salisbury County Club to take the vets and warriors fly fishing. We fish on the ponds right on the fairway. The club advises its members the back 9 will be closed from 5:00 PM. to 7:30PM. During each session the volunteers work with each caster to improve their skills and help then land Bluegills and Bass. 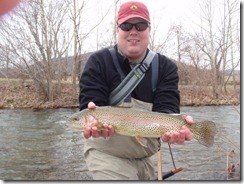 PHWFF provides all the rods and flies. Sometimes Vets fish their own flies they tied during the regular tying session. These sessions are held on the off nights when we are not fly fishing at the club. We are now working with the club on setting up the schedule for 2011. 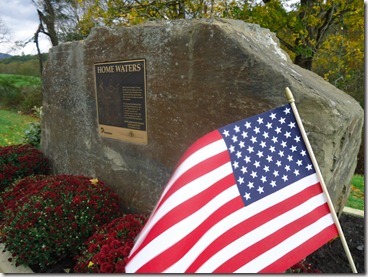 Salisbury, by allowing us to use their ponds are really supporting PHWFF and helping us supporting our great service men and women who have given so much to their country. 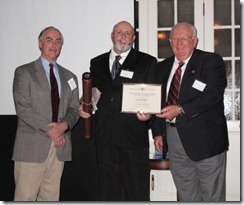 PHWFF salutes Salisbury Country Club for their kindness. April 12, 2011 turned out to be an overcast, sometimes rainy day at Ancarrow’s Landing on the James River near the I-95 bridge. Over the past three years PHWFF has had to cancel this event do to high water, high winds, and rain. But, this year the forecast of thundershowers never materialized. We were able to do a lot of fly fishing before we called it a day. There were a total of 8 boats with guides to assist the 11 warriors from the Ft. Eustis WTU and Vet Outpatients from Hunter McGuire Medical Center in Richmond. The boat owners came from Fly Fishers of Virginia, Ford Colony Fly Fishers of Williamsburg and The Virginia Dept. of Game and Inland Fisheries who provided their pontoon boat for the event. Each boat was supplied with drinks and box lunches as well as 9ft 8 wt rods with full sinking lines. It should be noted that Bass Pro Shops of Ashland, VA was very generous in donating 10 new full sinking lines. Without these lines the results would have been a lot fewer shad to the net. It’s safe to say most of the warriors and vets had never fly fished for shad, so with the assistance of the guides and some great shad flies, all warriors and vets were able to catch some shad. We had one vet take shad on flies he tied so that was very special. 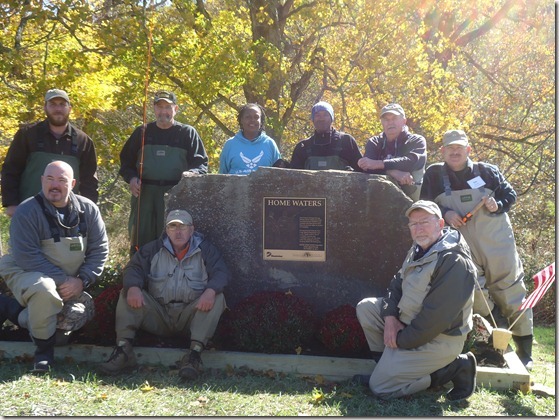 At the end of the day, all hands agreed we need to plan on doing this trip next spring when the shad return to the fall line on the James at Richmond, VA.
Warriors from Ft Eustis WTU and Vets from McGuire VA Center kick off the spring season in big way with a day on the ROSE RIVER FARM. Doug Dear owner of Rose River Farm private trout water again opened this well stocked water to the Warriors and Vets in the PHWFF program. With this kind offer it allowed new fly fishermen the rare opportunity to fly fish for really big Rainbows in fast moving water. The largest fish of the day was taken by US Army Cpt. Jake Goodine a 23” Rainbow. There were many nice size fish netted and all the Warriors and Vets had fish come to the net. Each Warrior and Vet had a guide working with them. This builds conference in the Warriors and Vets who are new to the sport of fly fishing. A special thank you goes to all the Volunteers who offered their time and talent. It’s interesting to note on this trip we had three new guys fly fish for the first time. At the end of the day all were ‘Hooked’ on the PHWFF program. Although it started off a bit frosty, by midday it was quite nice but made better then at lunch. Bowls of hot chicken soup and great deli sandwich were enjoyed by all hands. All in all it was a wonderful day on the Rose.